Looking to go out this weekend to somewhere different… with 360 degree views, a romantic “under the stars” ambiance and great food? Step onboard Luxury Tall Ship Royal Albatross for an award winning Dinner Cruise and a unique world class experience that will be remembered for years. Recommended by Trip Advisor and too many publications to mention, we are one of the top places to dine in Singapore because we offer more than just food. Our Dinner Cruise comes complete with a delicious 3 course meal served to your own private table on the ships upper deck, live entertainment and a welcome drink. Dinner is served as soon as our Superyacht sets sail, the soft ambient lighting, lapping of the water, gentle breeze and our live entertainment will put you in the mood for a night to remember. 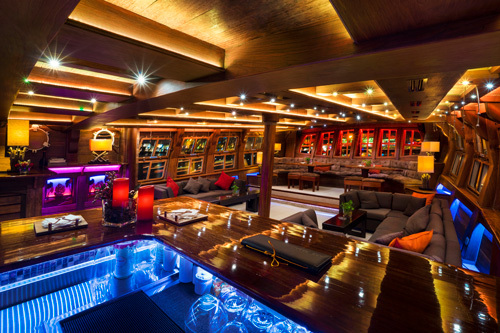 The Royal Albatross is equipped with two beautifully mood lit bars making them the perfect hang out after dinner as you walk around the yacht. Our upper deck bar is known for its special nautical aperitifs which are unique to the Royal Albatross, so be sure to ask for the evenings special cocktails. Little wonder the Royal Albatross is known as one of Singapore’s best restaurants. She has a unique and awesome ambience as you dine under a canopy of masts, rigging and her 22 sails with views like no other restaurant as our Super Yacht slowly sails along the coast and Singapore’s stunning Skyline. The Royal Albatross is truly Singapore’s best and only floating restaurant aboard a majestic tall ship, bringing delightful gastronomy with surreal views of the city at night. An Ambience so captivating and an experience so engaging, you are sure to remember for years. Do not miss this spectacular must-try dining experience. Add Royal Albatross to the bucket list for your next nights.